Welcome, Foolish Mortals… to Memento Mori, the new Haunted Mansion gift shop in Magic Kingdom’s Liberty Square! 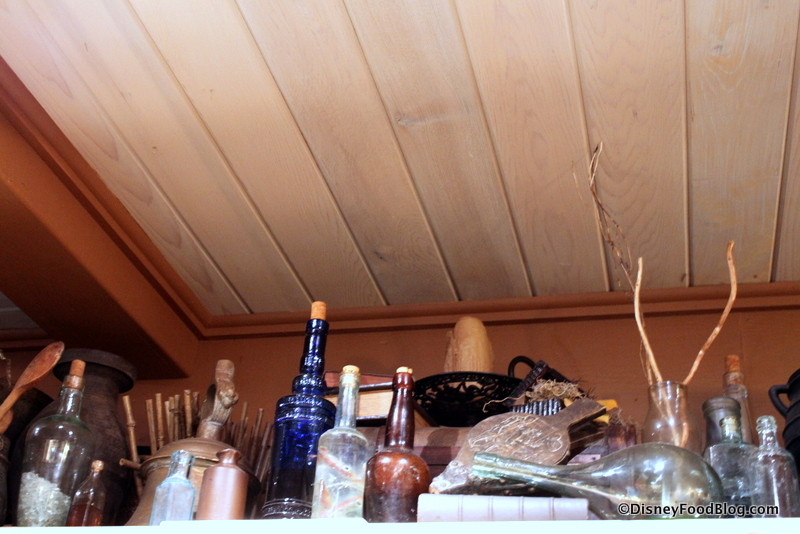 “Materializing” on October 6th, this spot (formerly Yankee Trader) is situated right by the Haunted Mansion, naturally. 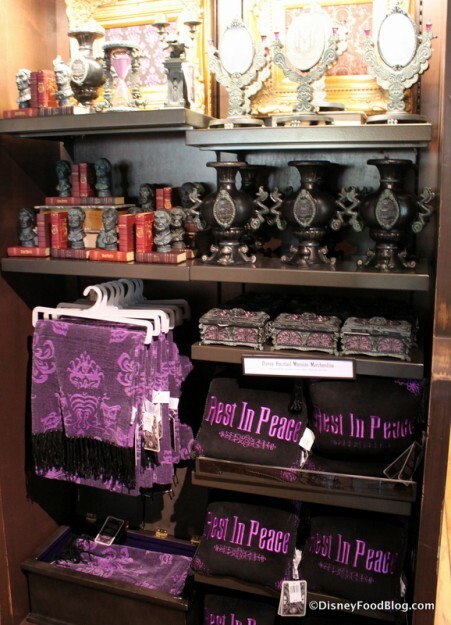 (The Haunted Mansion never HAD a gift shop, and Disney needed to remedy that, of course.) And we’re dying to show you Haunted Mansion fans some of the gems tucked inside… (and, yep — there are LOTS of awesome kitchen items and food-related goodies to share, too)! But seriously, this place is pretty awesome. I wandered the store for nearly an hour just trying to take it all in. Here are a couple of pics of the “atmosphere” around the top of the display areas. If you can’t get to the shop in person, some of the merch is available online. 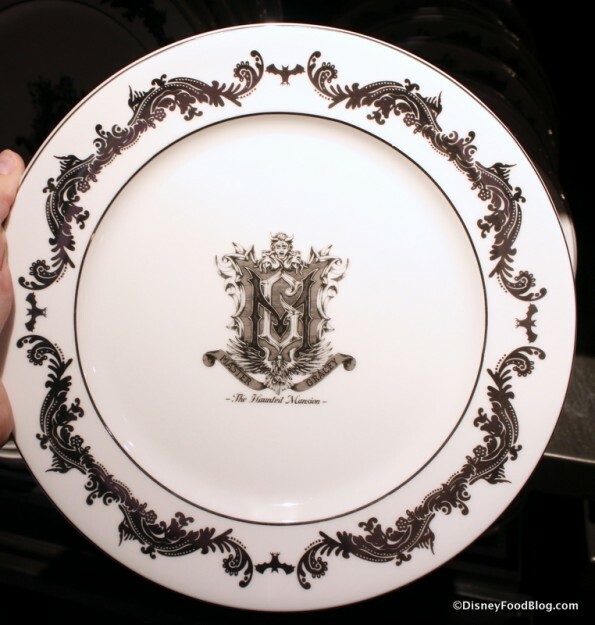 If you see a clickable link in our description, it will take you to the place where you can buy it. 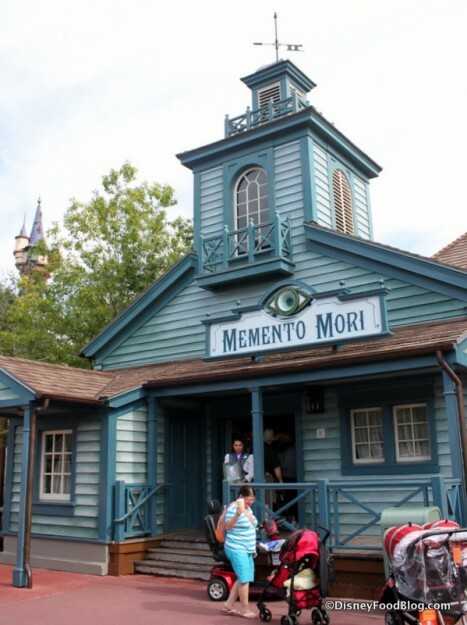 So, let’s head on in, because there’s ALWAYS room for one more at Memento Mori. Sorry for the blurry pic here; I just wanted to show you different sizes. Note that fans are held to only six of any item, per guest. 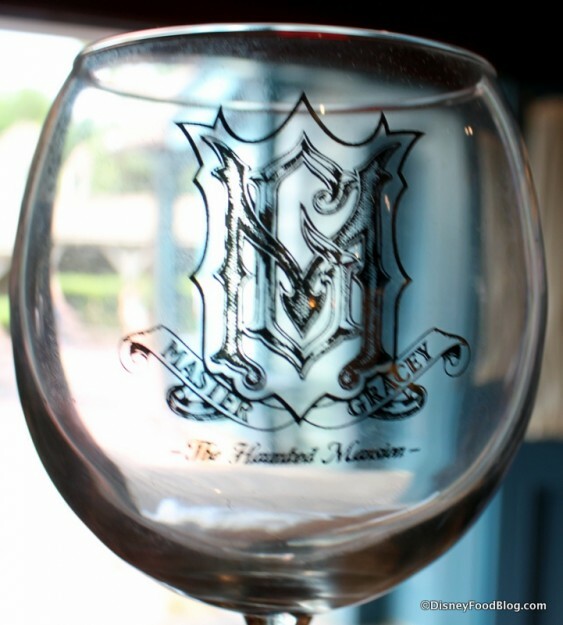 The ornate crest graces the stemmed glasses as well. 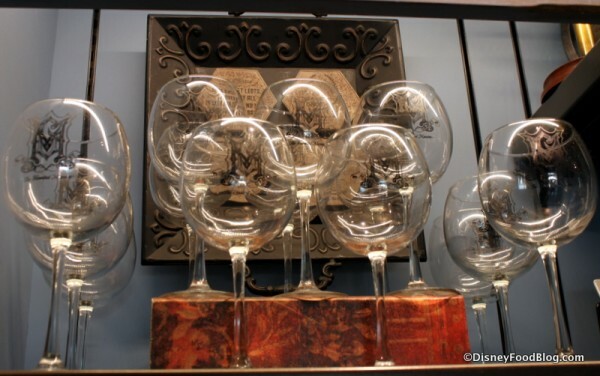 Both Red Wine Glasses and White Wine Glasses are available. 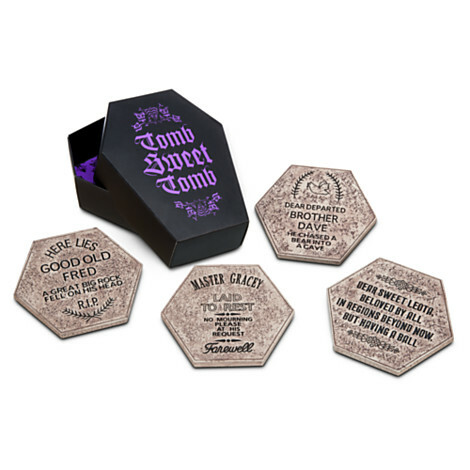 The popular Wine Bottle Stoppers and Tomb Sweet Tomb Coasters made their way over to the new location. 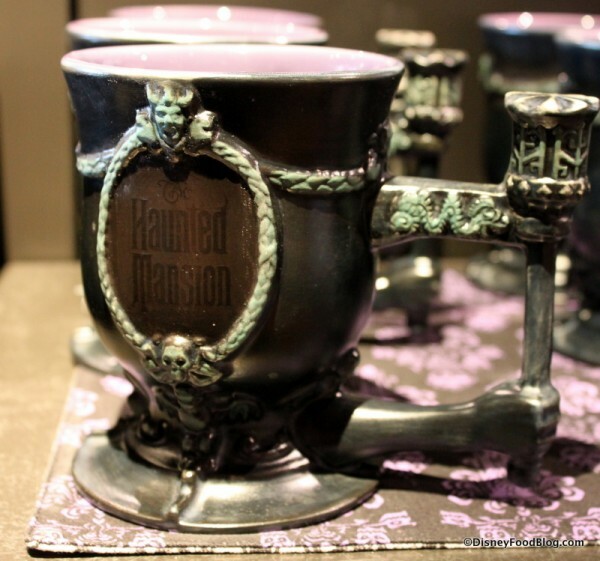 For warm beverages, we love this seriously hefty Sculpted Haunted Mansion Mug. 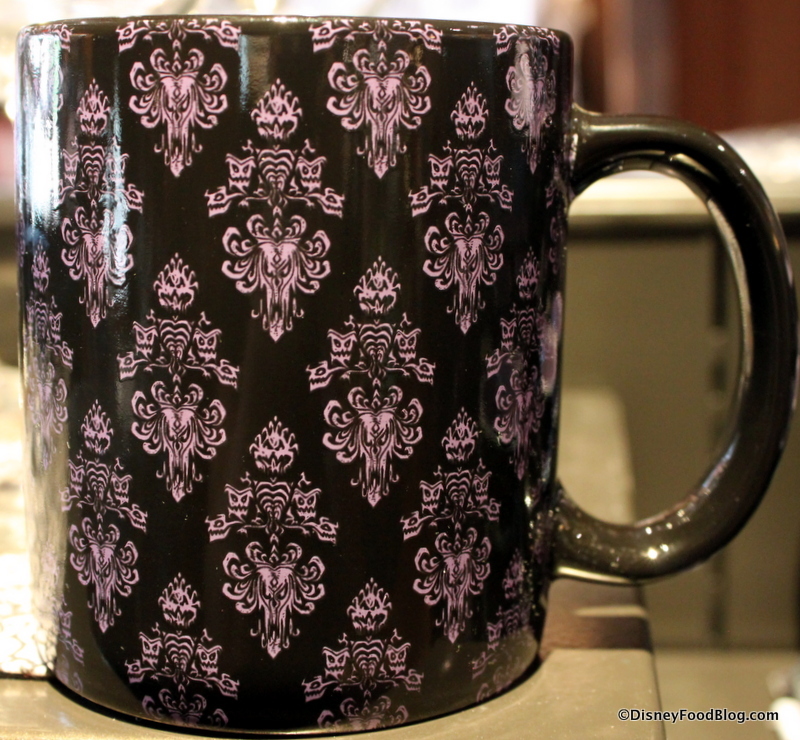 Or this mug, decorated with the Mansion’s damask wallpaper pattern. Finishing your drink might be the best part! 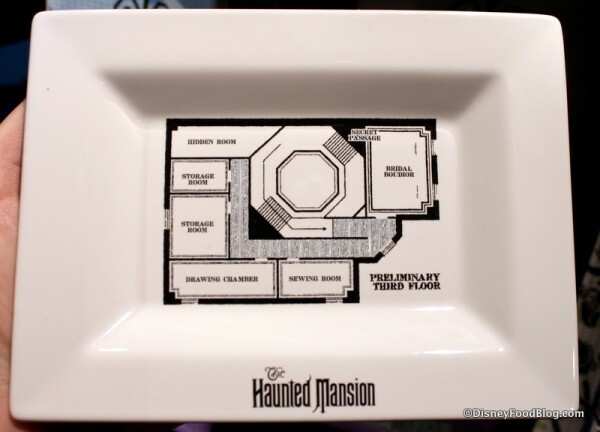 I love, love, LOVE this Appetizer Tray reflecting the floor plan of the Mansion. Different floor plans are also available in a dessert plate and a full-sized dinner plate. 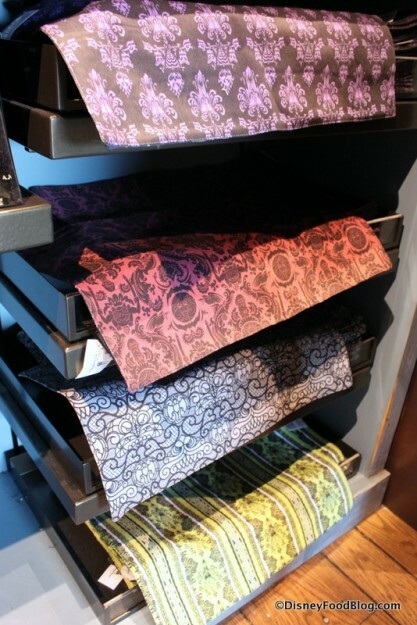 Patterned placemats come in purple, maroon, grey, and green. 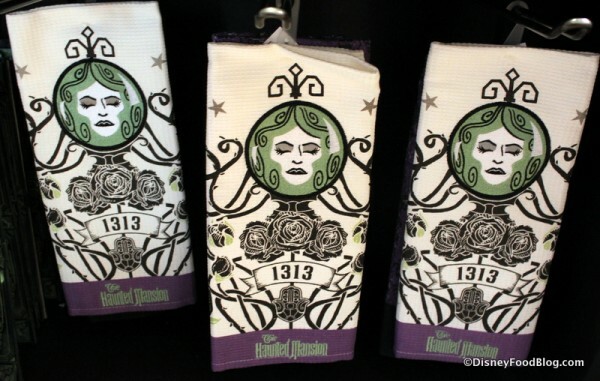 Madame Leota’s image is conjured on these Haunted Mansion Dish Towels. The famous epitaphs of Madame Leota, Good Old Fred, and Master Gracey decorate the packaging on these gray Tombstone Cookies. 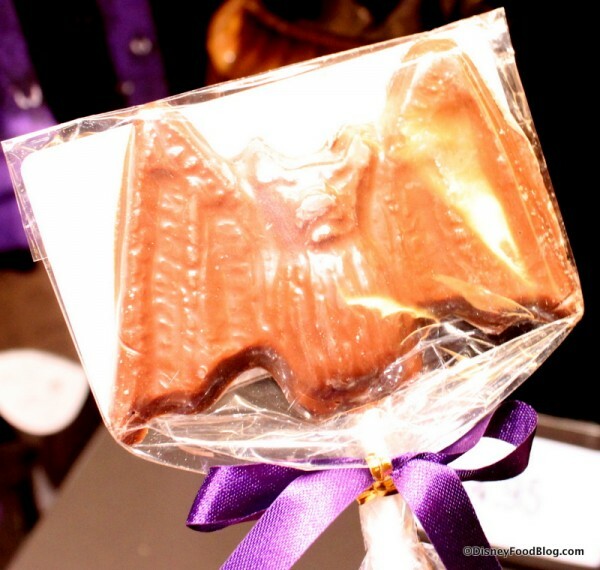 Chocolate lovers may prefer the Milk Chocolate Bat Pops. How about a creepy Krispy Treat? 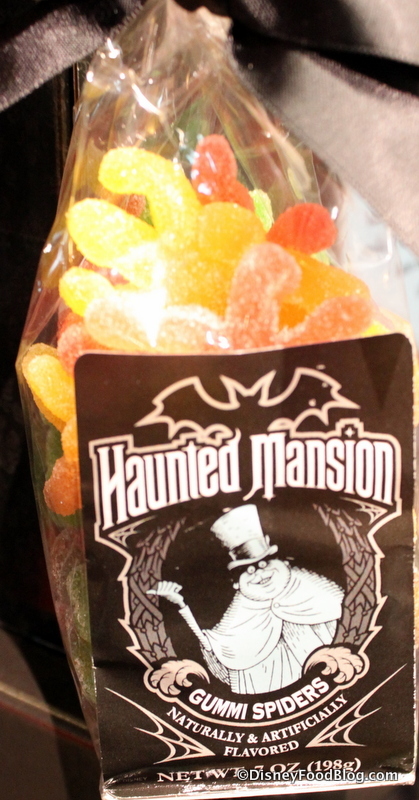 Or would you prefer the crawly Gummi Spiders? 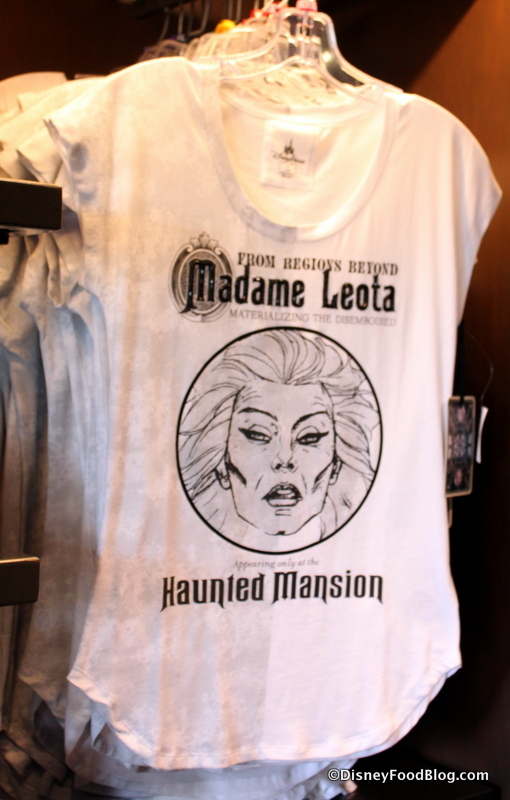 Perhaps you’d rather be the Ghost Host and greet the Foolish Mortals in your afterworld in this Women’s Ghost Host t-shirt. 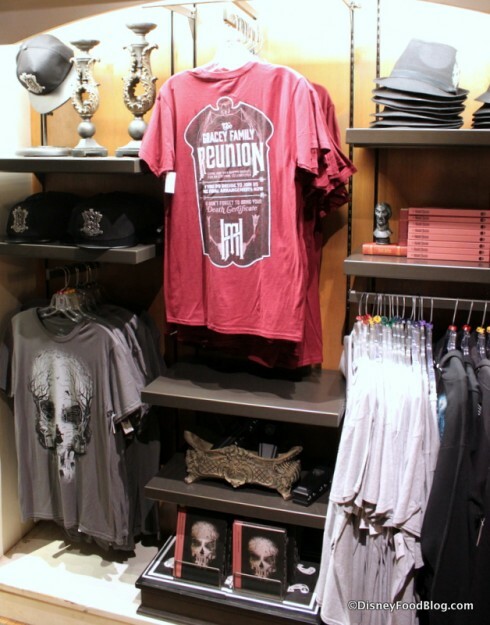 Lest you think the ghostly guys have been forgotten, there is a full display for men’s shirts including my favorite: the Gracey Family Reunion t-shirt. Catch a glimpse of your apparition in a Master Gracey Mirror. 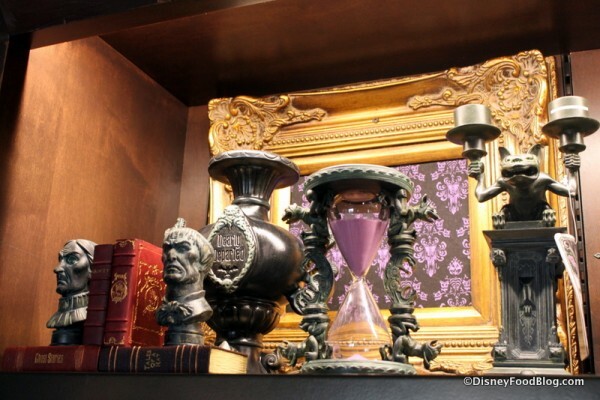 You can count down the time to your next Haunted Mansion visit with this Haunted Mansion Hourglass. 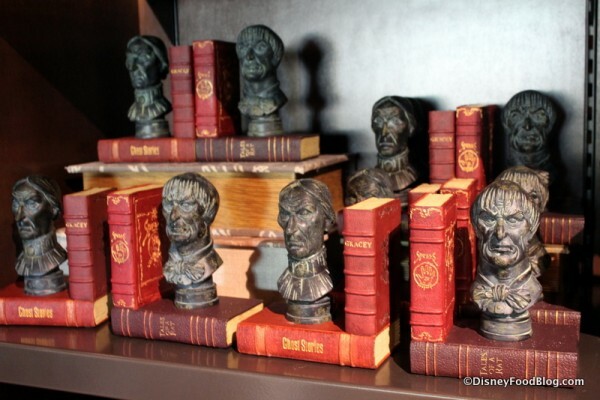 While these Bookends hold up all your favorite ghost stories. 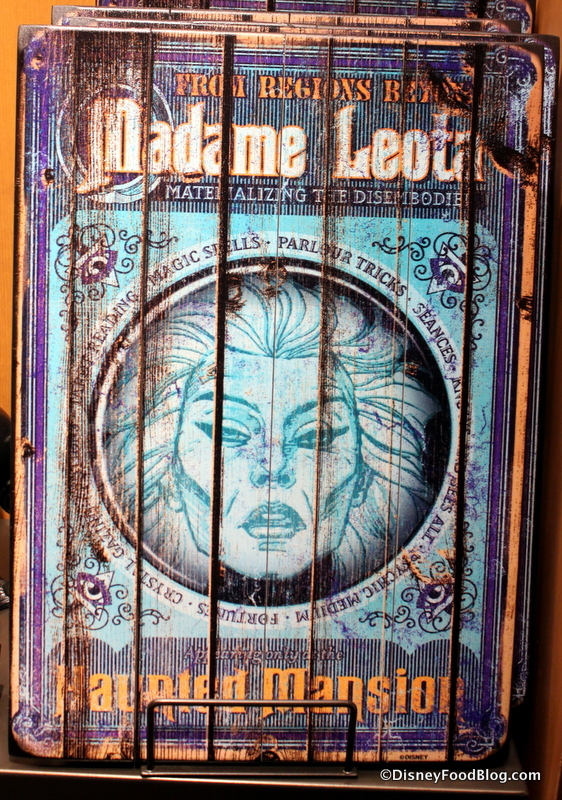 Memorialize Madame Leota with this wooden sign. 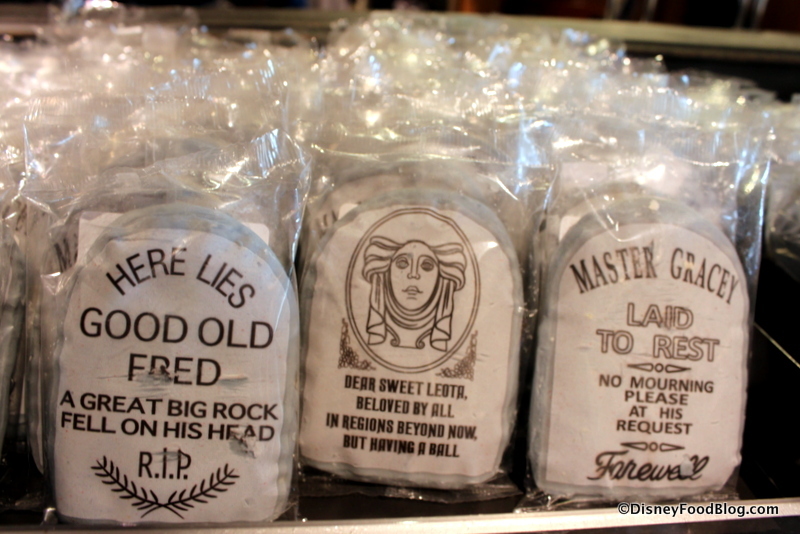 Favorite quotes from the ride can be remembered every time you snag a snack from the fridge when you get this Magnet Set. 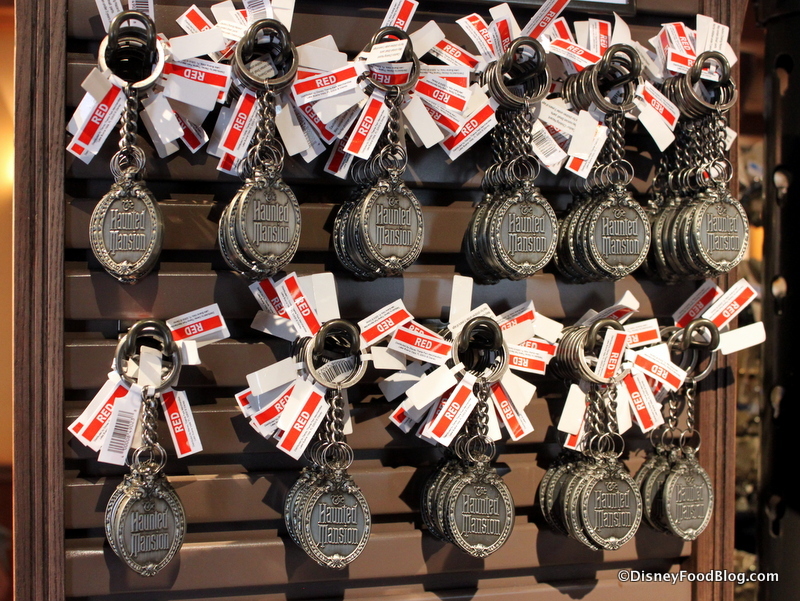 These keychains pay tribute to the attraction’s sign. Looking to spook up your MagicBand? Haunted Mansion graphic MagicBands are available for purchase. 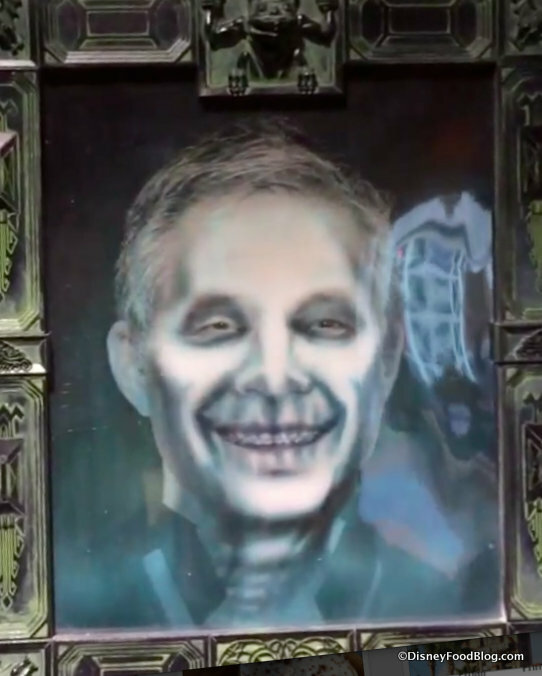 Beware of Hitchhiking Ghosts! These Action Figures glow in the dark. 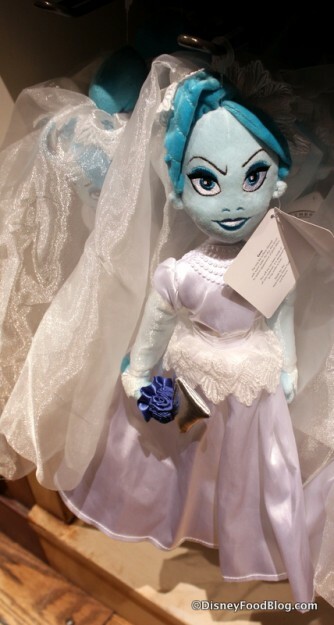 You may or may not want to take this Constance the Bride plush home with you when you consider how her husbands have fared. 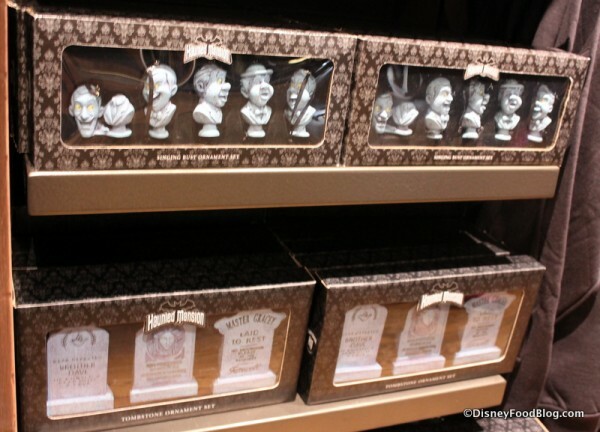 “Grim Grinning Ghosts” may become your favorite holiday song when you decorate with these Graveyard Bust Ornaments, unless you prefer the Tombstone set. 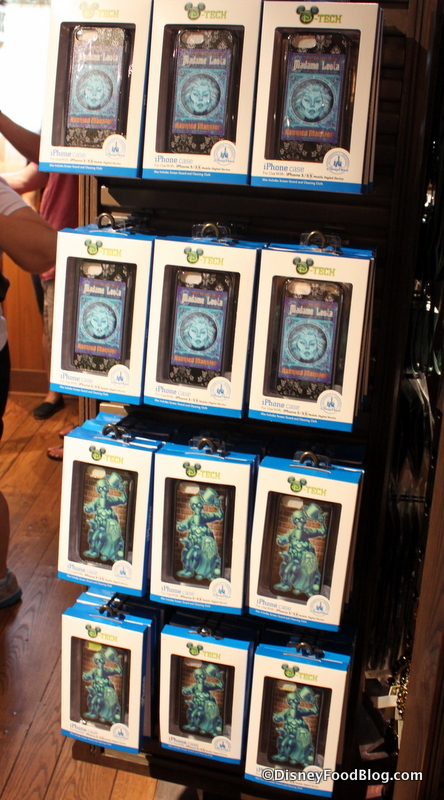 “Wizards and witches, wherever you dwell, give us a hint by ringing a bell…” Or, by giving us a call with your phone encased in a Haunted Mansion D-Tech phone cover. You know, whichever works! 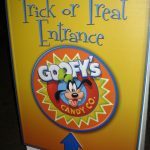 Okay, so we’ve saved the best for last, but you’ll have to check out the Disney Food Blog Instagram to see it in action. 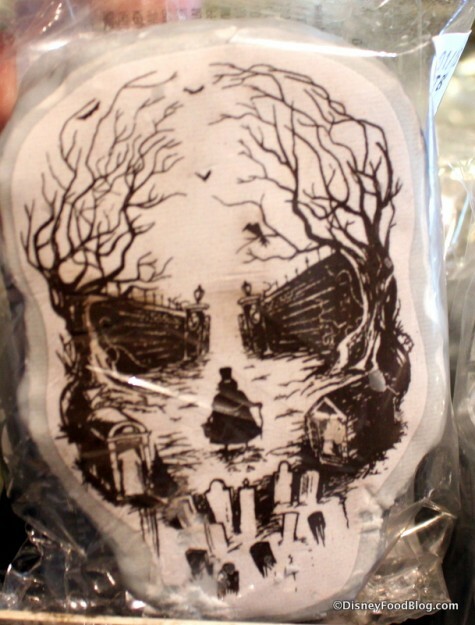 YOU can walk away from Memento Mori with your very own Ghost Portrait of yourself! 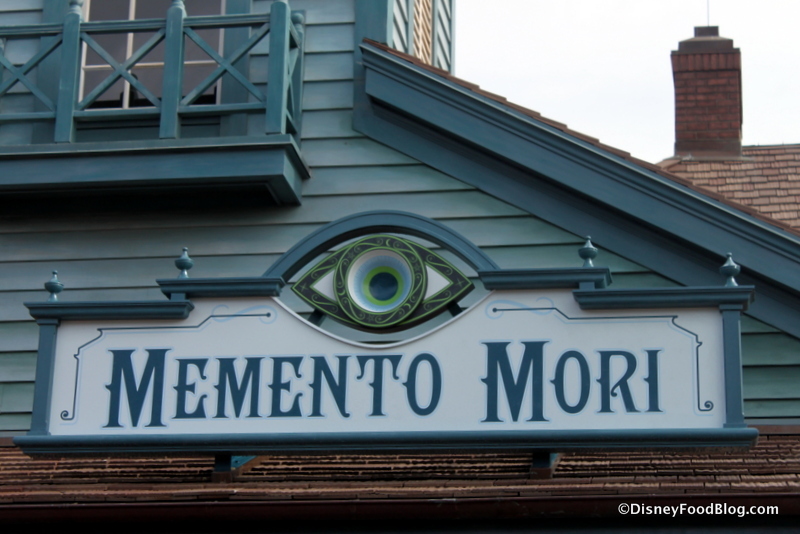 What is your favorite item at Memento Mori? Please let us know with a comment! 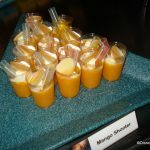 Wishes Fireworks Dessert Party Photos! New Disney Food Blog Mini-Guides: Tell Us What You Want To Know! The store was in soft opening when we were there for Mickey’s Not-So-Scary Halloween Party on October 2nd. At some times of the evening, the line to get into the store exceeded 45 minutes! 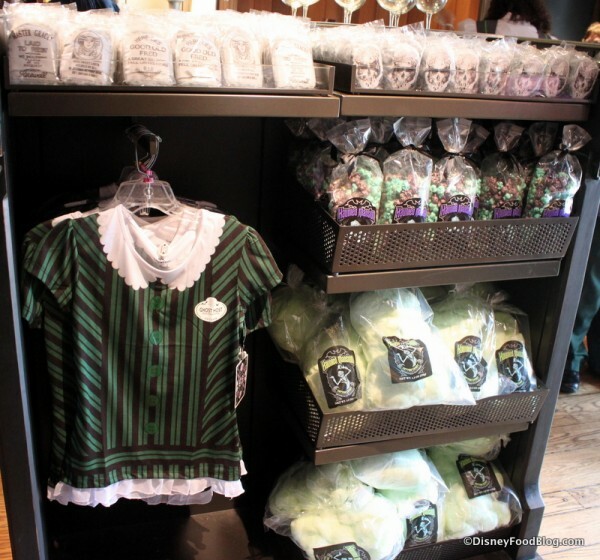 I got the dish towel set and the female Haunted Mansion cast member shirt. I don’t think that the food items were on display yet, but I could be wrong. The store was packed, so it was hard to see everything. 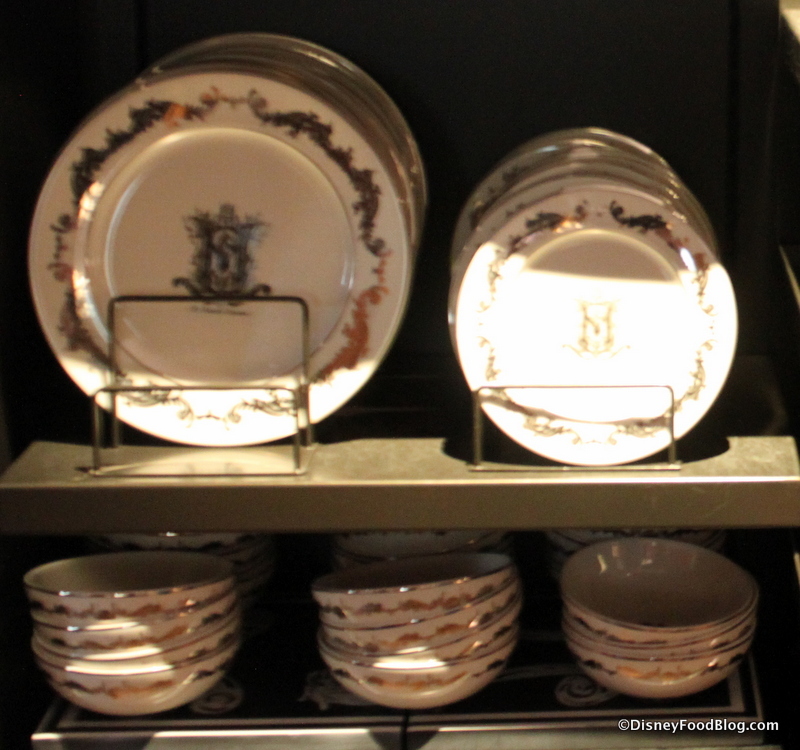 I will definitely be back there soon, because there are still several items on my to buy list! How big is that wooden Madame Leota sign? 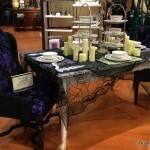 I think that would be awesome in my house all year round!! Ahhhhhh I’m so excited!! We’ll be there in February! 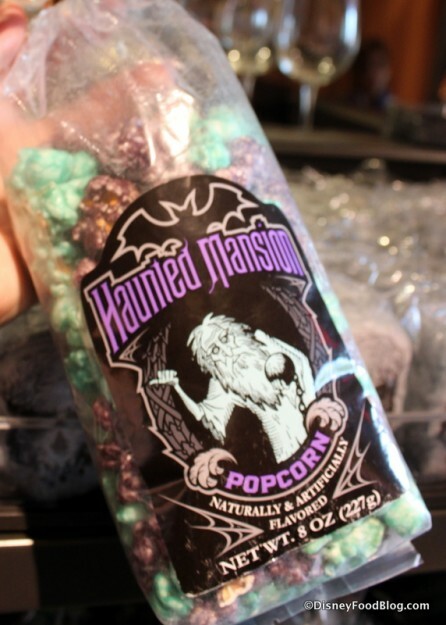 I love the haunted mansion! I can’t wait! 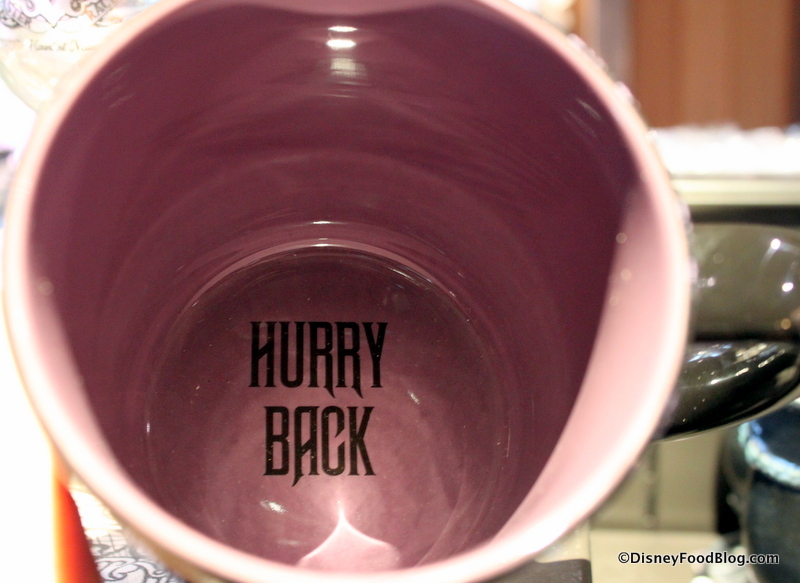 We will be in WDW next week and I’m pretty sure I will walk away from the store broke. I want it all! Too many to decide based on your photos. We leave this coming Sunday and I can’t wait to get to this shop!! !But if I had to pick just one thing from the photos you posted it would probably be… a tie between The Game of Life Haunted Mansion Edition and the coffee mug! We were there Saturday and my three-year-old had to have Constance….I had to have the veiled headband which I’m now trying to build a costume around! 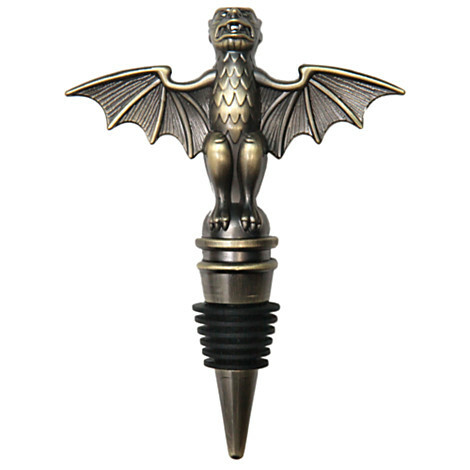 I LOVE this, I want it all! We got a chance to walk around it on opening day. It’s a very tiny shop, and there were only two checkout counters. I hope they can handle the traffic. 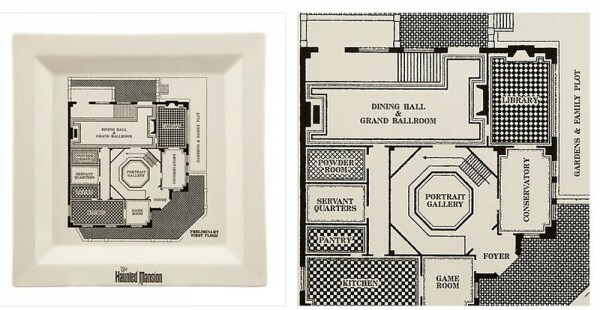 Those plates with the floor plan were amazing. I think I must have that sculpted mug! 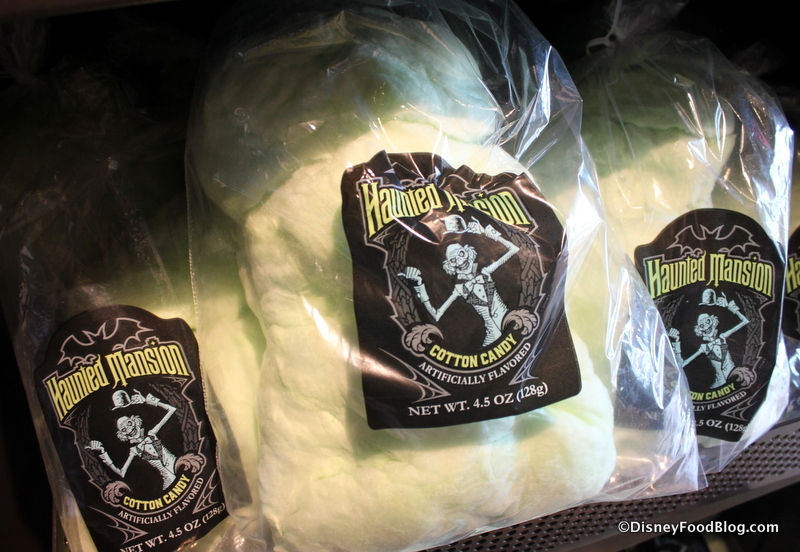 And cotton candy! And…and…oh dear, this will be a major danger zone come April. I love this shop! I can see myself spending lots of money there. We were there during MNSSHP on October 5th and in was almost a half an hour wait to just get in the shop…but soooo worth the wait! I think I spend my souvenir budget right then and there! 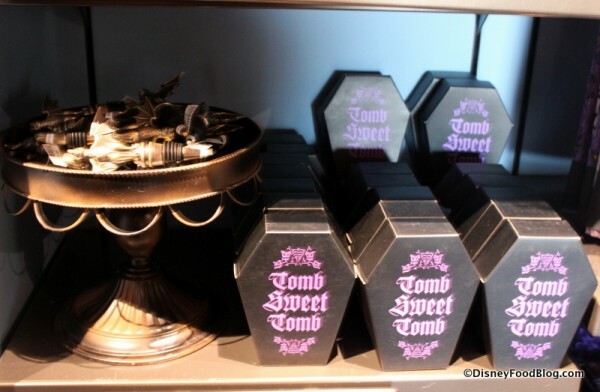 what an awesome store!, compared to the cart that used to be outside of the haunted mansion, it has so much stuff that every “foolish mortal” that goes in the store would make everything disappear into thin air, happy Halloween, mwahahahahahaha! Did they pour the white wine for you to test the wine glass? 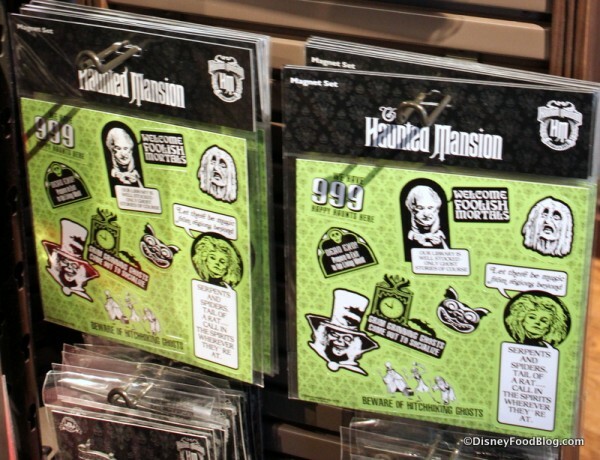 We will be at WDW in December….. Can’t wait to visit the Haunted Mansion store!!!! 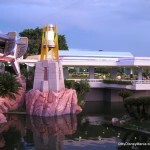 I’m sure it will become one of our favorite places to shop while we’re at Magic Kingdom!! I think I’ll start packing this weekend!!!!!!! I am getting one of those Ghost Host shirts. just got back from disney. 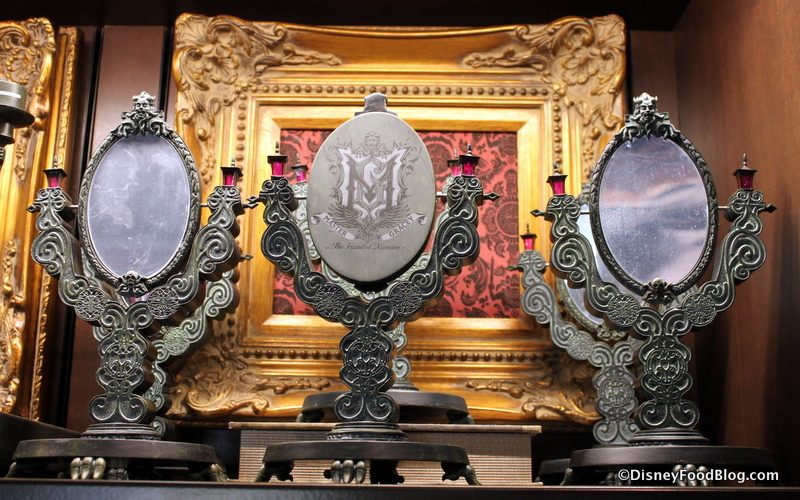 loved the new store memento mori but was disappointed that the oval haunted mansion sign for$90 was not in stock. anyone know if more are coming and when. thanks for any help. Oh BOO HISS! My sisters and I visited Disneyland in August. I saw the Haunted Mansion female cast members ‘shirt there, loved it for this year’s Halloween, but alas, did not make the purchase then. Upon my return to Brooklyn,NY, I searched the Disney store Park Merchandise section but could not fine the item I “left behind”. 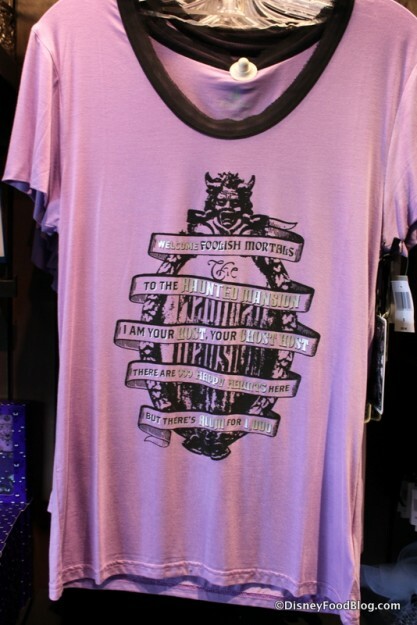 I called Customer Service and had the cast member search for such a shirt to no avail. 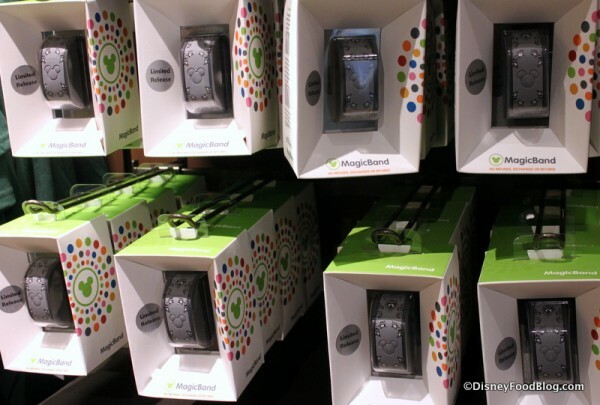 I guess LA was ahead of the curve and their items were not as yet in inventory.. In the end, I’m happy someone might have been able to buy this item before Halloween ’14 by being at either park itself. I know now, “to go with my gut” when I see something I like! It is a great item and I’m sure to try to purchase it when I visit WDW after Christmas with my daughter and two wonderful teenage granddaughters! (Maybe one for each of us! )Thanks for posting this information. 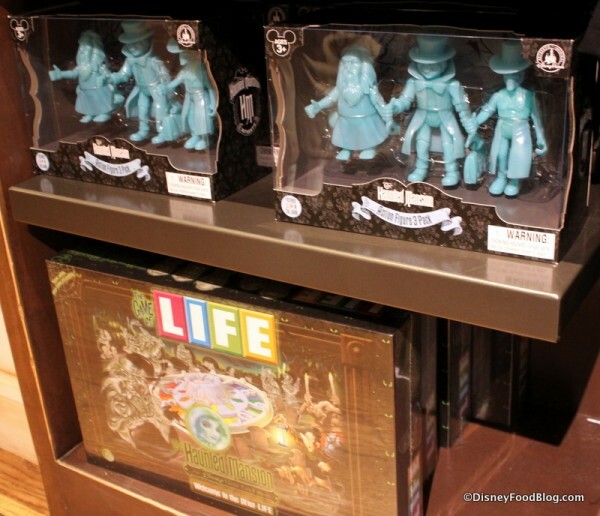 Do you still carry the figure Hitchhiking Ghosts by Jim Shore? If so, how much is it and how do I order? Does anyone know how to contact this store by phone? We got back from disney world last Friday. 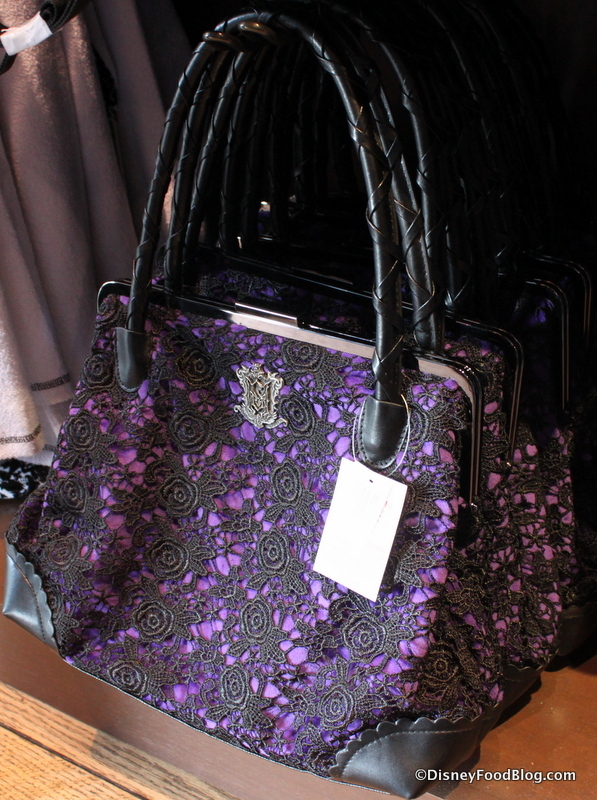 I stumbled on the shop by chance (I’ve never been to Disney before) and loved it! 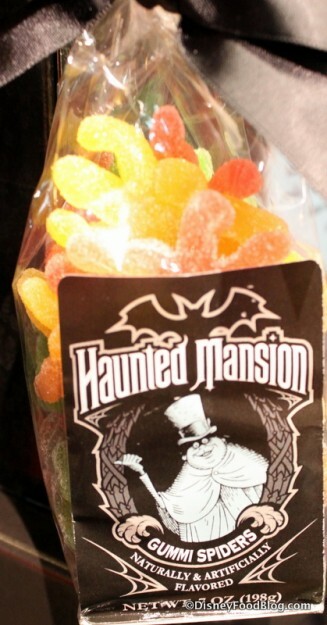 We went on the ride, got a photo in the front of the mansion with the ghost driving the horseless carriage, and got the ghost photo!! It was all amazing!! My son and I both got the photo. Best purchase in all disney world, and only 20 bucks.